March 27, 2017 -- Many patients who present with a temporomandibular disorder (TMD) or pain will go on to have only transient symptoms. Determining which patients are more likely to have persistent problems can help identify ideal candidates for targeted treatments and reduce the risk of chronic pain. Carolina Beraldo Meloto, DDS, PhD. Researchers examined multiple physical and psychological characteristics at TMD diagnosis to determine which factors best predict the development of chronic TMD. Overall, they found that those patients later diagnosed as having chronic TMD were more likely to have masticatory muscle group measures of pain on maximum opening when they first were seen in the dental office. The results were presented at the recent International Association for Dental Research (IADR) annual meeting in San Francisco. 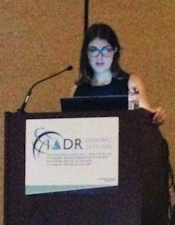 The research was presented by Carolina Beraldo Meloto, DDS, PhD, a postdoctoral fellow at McGill University in Montreal. Subjects with generally poor clinical outcomes at TMD onset went on to develop chronic TMD, she explained. Biopsychosocial factors, which include pain intensity and location, physical function, depression, and anxiety, didn't appear to be different between patients whose TMD was transient and those with a persistent condition, she noted. "Biopsychosocial measures contribute before TMD develops," she said. Dr. Meloto presented data from the Orofacial Pain: Prospective Evaluation and Risk Assessment Study of first-onset TMD, which has identified clinical and psychosocial characteristics associated with a higher risk of developing TMD. These factors are likely to be assessed only when patients first present with TMD symptoms, according to the researchers. In the current study, Dr. Meloto and colleagues examined biopsychosocial characteristics at first presentation with the objective of predicting which patients would transition to persistent TMD. The data included 260 adults who developed TMD and were assessed using diagnostic criteria for TMD. After six months, 147 patients were reassessed. Of those, 72 (49%) were found to have persistent TMD while the rest no longer had TMD symptoms. Among the patients with persistent cases of TMD, more than 58% were female and almost 60% were white and non-Hispanic. At TMD onset, researchers were able to predict 71% of persistent cases if the patient had masticatory muscle group measures of pain on maximum opening and were tender to palpation (using the Axis I protocol of the Research Diagnostic Criteria for Temporomandibular Disorders). When the researchers included Axis II protocol measures (chewing limitation, self-reporting of parafunctional oral behaviors, and number of comorbid conditions), they were able to increase their prediction success rate to 77%. Overall, when patients first present with TMD, it is an ideal time to identify those more likely to have persistent cases and initiate treatment to reduce this risk, the reported. Dr. Meloto said she had been surprised to find that biopsychosocial factors did not differentiate between persistent and transient cases once TMD initially developed. "Once the disease develops, these factors don't differentiate between transient and chronic patients," she said. So what should dentists conclude from these results? "If your patient has bad clinical signs to start with, keep a close eye on them," Dr. Meloto told DrBicuspid.com. "Focus on treatment to avoid chronic TMD."